Ukrainian President Petro Poroshenko plans to sign a decree on the formation of the mobilization reserve. "Today I will sign a decree on amendments to the law on forming the mobilization reserve. Everyone who has shown his best today will be included in the first priority reserve. 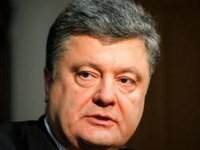 The automated electronic registration will be designed, and if ceasefire is broken and Ukraine faces a threat of military strike and continuation of hostilities by the aggressor, we would be able to restore and boost our army and combat effectiveness in several hours," the president said at a meeting with Volunteer Force of the Defense Ministry of Ukraine on Saturday. As reported, one of the goals of the fourth mobilization wave is the formation of the mobilization reserve for rotations of troops in the antiterrorist operation (ATO) zone.